A message from Meredith: Hey everyone! 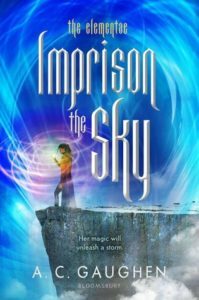 Today, I have Lissa here with a guest review for Imprison the Sky by A.C. Gaughen! I didn’t have time to re-read Reign the Earth before I read Imprison the Sky, and having just finished, I am a bit indecisive as to whether that is a good thing or a bad thing. Maybe both. It seemed problematic when I started Imprison the Sky because I felt like I remembered nothing and had no idea who anyone was. Then as I got into the story (it sucked me in completely, regardless!) I remembered bits from Reign the Earth and realized I would have mostly been clueless anyway. Which is when I switched my opinion on the re-read issue. If I had re-read, I would have been clamoring for a direct continuation of Shalia’s story. And this was not that – it read almost as a companion novel rather than a sequel. For all I know, since I still haven’t read the blurb (I didn’t need to, I knew I wanted to read this book even without the blurb), maybe that is what it is supposed to be. It did, however, forward the overall story arc in the end. Anyway, wanting/missing Shalia and Galen would have been a disservice to this wonderful, enthralling, couldn’t-put-down adventure. I have a thing for spunky seafaring heroines (like Sherwood Smith and Alex Lidell write) and this was just perfect – complimented by A.C. Gaughen’s characteristic grit (Oh, how her heroes/heroines suffer!). So here I am, urging you to read this book (even if you haven’t read Reign the Earth) and already dying for the next one – though I imagine that will be companion-like as well, so now I know and will be better prepared for it.